The Countess Conspiracy is an incredible read with incredible characters. Violet it a brilliant woman who is forced to hide intelligence from the world. Or I believe it's more correct to say they 19th century world she lives in won't even give her a chance to demonstrate that she is more than just a womb. Violet and her longtime friend, Sebastian conspires together and it is Sebastian who brings her paradigm shifting theories on evolution to the world. Sebastian agrees to do this for her, because he has loved her for forever and Violet is completely oblivious. 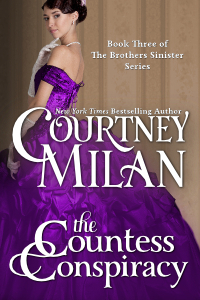 What happens next is what makes Courtney Milan's books so wonderful, her characters never fail to surprise me. As the story unfolds we see emotional and physical pain that Violet has suffered. Violet has suffered because she is a woman in the 19th Century and there were no other options for her. Together, Violet and Sebastian fall in love and re-write the rules. This book manages to be poignant and funny at the same time!